When doing fermentation, e.g.sauerkraut, in a mason jar, it is essential that the jar ingredients be always immersed in the liquid. The internet has various devices to achieve this, some almost silly. My method is dead simple and effective. A readily available plastic cup is pushed into the mason jar and then cut level with the jar top. The red color of the cup does not leach out. A hole is made in the bottom of the cup to allow the liquid to seek its own level. The lid is placed on the jar. 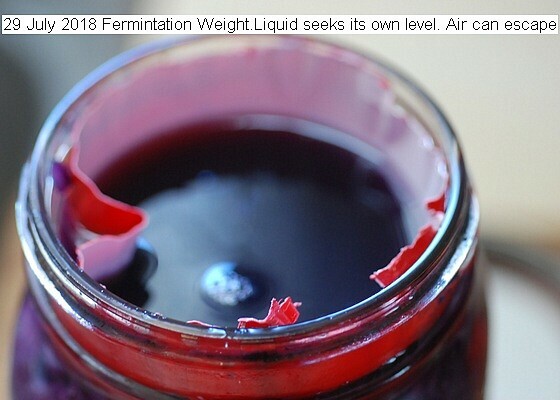 Air can escape and the ingredients remain under the liquid. Pictures depict the method. This entry was posted in Uncategorized and tagged 29 July 2018 Fermentation Weight, Fermentation Weight for mason jar.. Bookmark the permalink.